I don’t know about you but my rhubarb is in full on full force production. Whew, it’s hard to keep up, but I’m harvesting, freezing and baking as fast as I can. My recipe for Rhubarb Oatmeal Bars and Strawberry Oatmeal Rhubarb Bars was well received so I decided to try my hand at a quick bread. I needed a recipe that was quick and easy to make yet delicious. 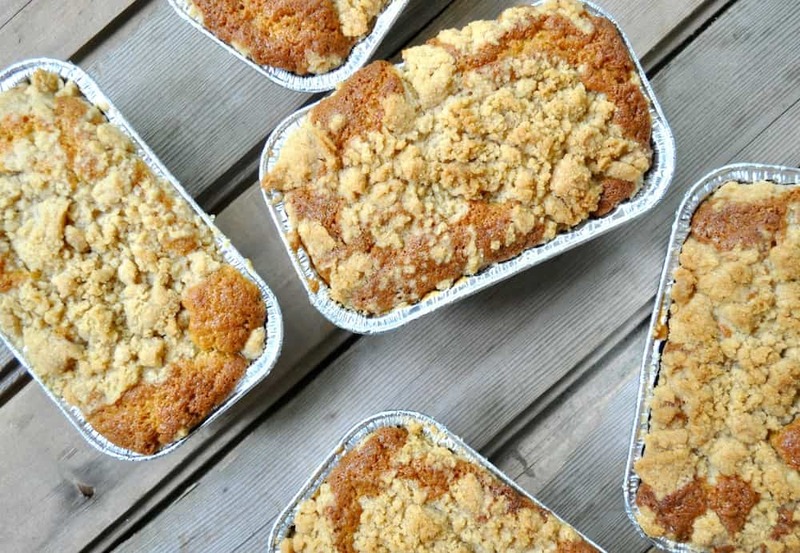 This recipe makes 8 mini-loaves but you can also make it into a nice big fat 9×13 coffee cake. 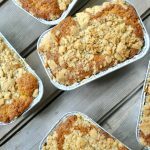 Any way you make it this Rhubarb Bread with Streusel Topping is a surefire hit, so be sure to freeze enough rhubarb to make it all winter long. I have a well-established rhubarb patch, it’s a least 42 years old. The plants are big and produce a lot of stalks of red and green rhubarb. I try like hell to use all the rhubarb the plants produce. I either bake with it or freeze it for later use. I’ve linked my favorite recipes down below if you need more inspiration. Regardless of what you might have heard, rhubarb doesn’t have a “ripe stage”. When it first pops out of the ground in the spring it’s ready to use. I do let it grow a bit so the plant has a chance to replenish itself from winter. I think I let the stalks get at least 10 inches long before pulling them out. It’s always sour so don’t wait for that to go away, just harvest away. That’s important too. Pull the stems to harvest them. If you just cut them the plant doesn’t know it needs to produce more rhubarb. Once you pull a stalk the plant gets busy producing more rhubarb. It’s everbearing so be ready to eat and enjoy your rhubarb all spring and summer long. I don't know about you but my rhubarb is in full on full force production. 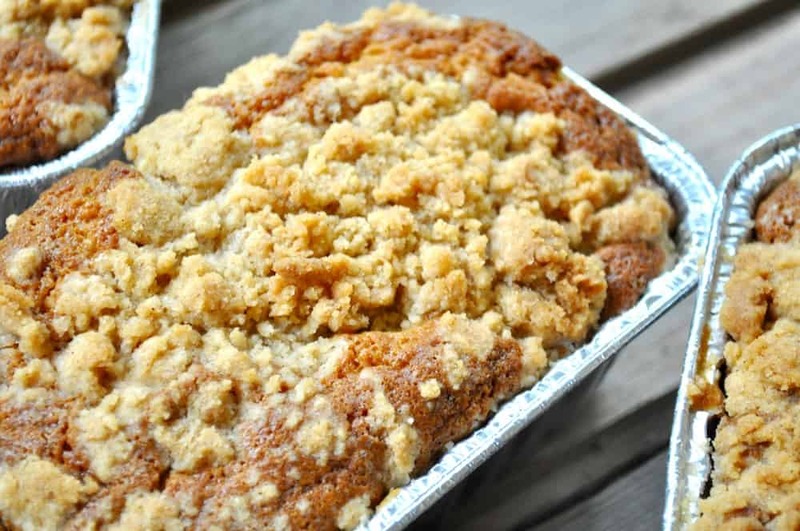 This recipe makes 8 mini-loaves but you can also make it into a nice big fat 9x13 coffee cake. 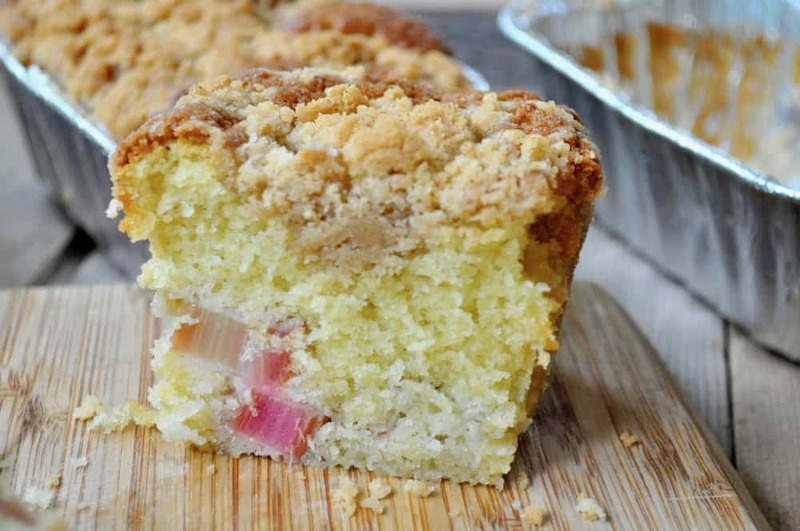 Any way you make it this Rhubarb Bread with Streusel Topping is a surefire hit, so be sure to freeze enough rhubarb to make it all winter long. If you like rhubarb I have a couple of other delicious recipes for you, I hope you enjoy them. Yum! These little loaves look scrumptious. My mom’s rhubarb patch went woefully underutilized this year and I feel bad that I didn’t get more before it got too hot for it. Now my list for things to make next year is growing!